A new concept in Expabded Shells. 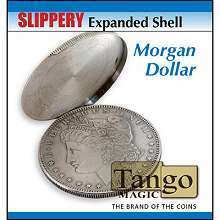 The Slippery Shell is similar to a regular shell except that this one slides on and off another coin. With a regular expanded shell the shell needs to be lifted, with a Slippery it slides. Many effects are possible with this gimmick. Can be used in a "3 Fly" routine.